For women, dress hats do not need to be removed when indoors. This rule of etiquette has developed out of the role of women’s hats as an outfit-specific accessory as opposed to a general one. Where men may have many hats available to match a variety of outfits, women may match only one hat with a single outfit. By a similar rule, women’s hats worn strictly for warmth should be removed when indoors. Men are expected to remove their hats during the playing of the National Anthem. A woman may leave her hat on during the playing of The National Anthem when indoors, unless it is considered unisex like a baseball cap. When wearing such a unisex cap, a woman should follow the same guidelines as for men. For men’s hats, any ornaments or decoration on the left side of the hat. The opposite is true of women’s hats, hat pins and other ornaments should be placed on the right. If you’re wearing what is traditionally thought of as a man’s hat, such as a baseball cap or a Panama hat, you should follow all the rules for men, above. Hats traditionally thought of as “women’s hats,” with ribbons, bows, feathers, flowers, or other ornamentation, or in delicate colours and materials, including the small hats worn on the front of the head and known as fascinators, may be kept on indoors for all occasions, except when you’re wearing a large hat at the movies, the theatre, or any other kind of performance event. In this case, remove it and place it on your lap so that people behind you can see the stage. 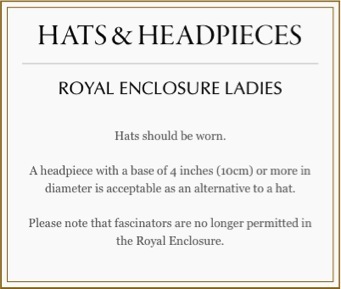 Women should wear a hat to Royal Ascot and smart race meetings; hats are traditional, but by no means compulsory, at weddings, and a matter of personal choice for christenings and funerals. 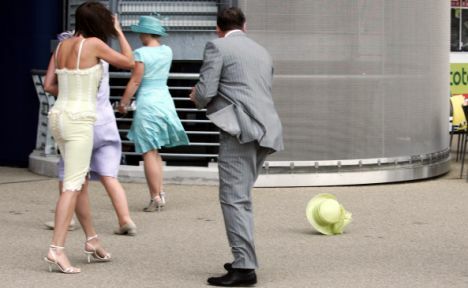 Make sure that your hat is SECURE – on a Windy day at Ascot you do not want to be holding on to your hat all day. Every person’s head is completely different and your milliner will be able to fit the hat bespoke to your head. For small headpieces please make sure that they are resting just above the eyebrow, there is nothing worse than seeing the piece balancing on the top of the head, – This will also affect the security. For Larger hats personally I prefer when a brim cuts the eye line adding romance and drama, but larger hats can be worn as desired as long as the fit properly. It is notoriously difficult to socially kiss while wearing a wide-brimmed hat. There is a knack to tilting the head at a suitable angle, but two ladies both in wide brimmed hats should avoid such an ‘intimate’ greeting. If your face is long, balance out the length by wearing an elegant cotton beret on one side of your head.